The 28.72 metre motor yacht Take 5 has changed central agencies and is now listed for sale by Giulio Riggio at Fraser Yachts. Built in GRP by Taiwan's Kha Shing yard, Take 5 was delivered in 1994 as a Monte Fino model. She has been immaculately maintained by her current owners, who carried out a comprehensive refit in 2006 – 2008, including rebuilding of both main engines, new decks, new outer windows, new anchor chains and capstans, new hydraulics on the stern door, new underwater lights, new air conditioning and full CCTV monitoring. Her interior is in Japanese ash and she has Alcantara ceilings instead of the more usual vinyl. Accommodation is for eight guests in four cabins laid out as three doubles and a twin, all with en suite shower facilities. 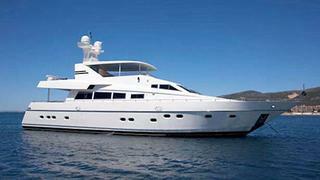 Her flybridge is the ideal area for entertaining and al fresco dining with a bar, dining table and a Bimini top. She also has a hot and cold shower system on the swim platform. Twin 1,100hp MAN engines give her a cruising speed of 12 knots and a range of 1,200 nautical miles. Lying in Palma de Mallorca, Spain, Take 5 is asking €1.5 million with VAT paid.